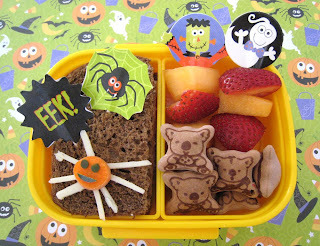 Only 9 more days of Halloween lunches & snacks to go. I plan to make the most of it. My friend Shannon found the green spider and eek picks for me the other day, along with matching cupcake wrappers. 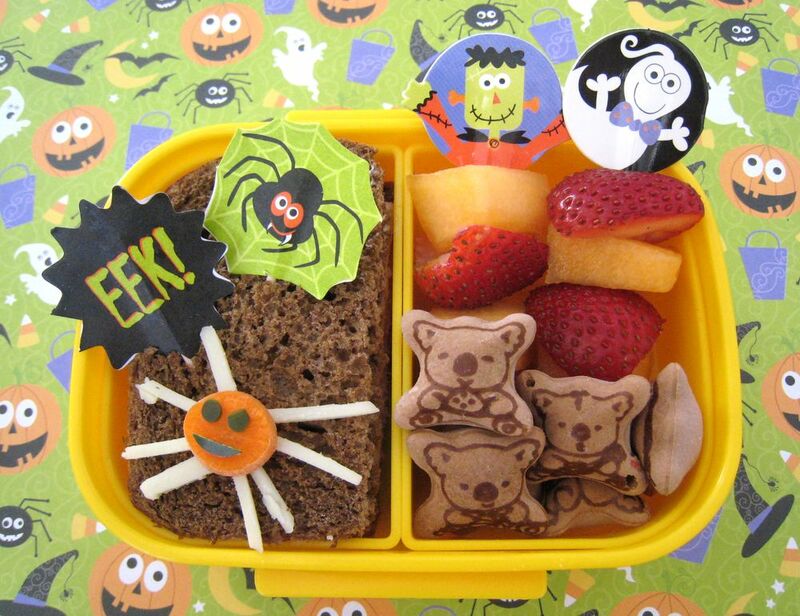 The picks were begging to be used in a bento, they are too cute! The Frankenstein & ghost fruit picks were one of my finds. Hobby Lobby has some really cute stuff that is their brand, along with a good variety of Wilton stuff. I restrained and only came home with about $10 worth of Halloween and Thanksgiving bento goodies. Mr. Ben had this snack box. He had half a ham and cheese sandwich on pumpernickel rye, topped with spider picks and a little carrot spider. White cheddar slivers make his legs, his body is a single carrot round and cucumber peel is used for his eyes and mouth! To the right, we have two cantaloupe and strawberry kebabs and some chocolate koala cookies. I whined for years about not having a Hobby Lobby in AZ and now that we have one I forget to go there! I usually run into Joann's because it is more convenient, but was so glad I went to HL. I didnt realize how much of their own cookie cutters, decorative pics, sprinkles, etc, that they have!